Bahrain has an ethnically diverse population which is reflected in its culture. 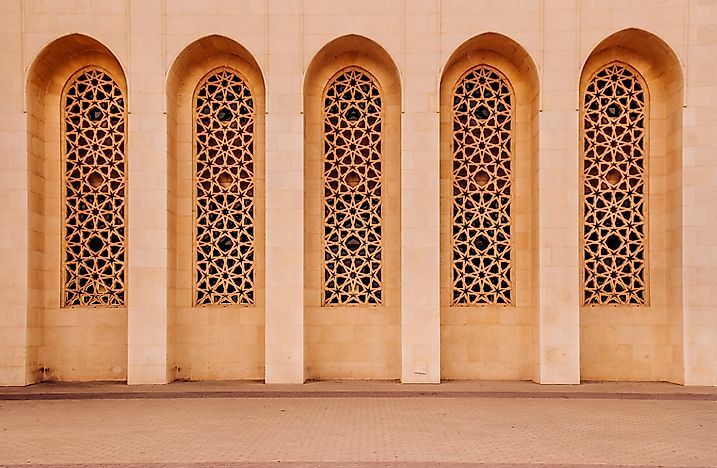 A mosque's exterior in Bahrain. Bahrain has one of the most ethnically diverse societies in the world, owing to the cosmopolitan nature of its population. Foreign citizens outnumber Bahraini citizens, and therefore foreign influence has been integral in shaping the culture of the kingdom. Foreign influence can be seen in the language in Bahrain. While Arabic is recognized as the kingdom’s official language, Persian, Urdu, and English are some of the popular languages in Bahrain. Nonetheless, the culture of Bahrain is largely based on Arabic culture and is similar to the cultures of the kingdom’s neighboring countries. The most popular language in Bahrain is Bahraini Arabic, a local dialect of Arabic used in the kingdom. The official religion in the country is Islam and is recognized as such in the Constitution. The Constitution also spells out religion freedom, but the government restricts this freedom in specific instances. Muslims account for about 99.8% of Bahraini citizens. The majority of Muslims in the kingdom identify as Shia Muslims, constituting at least 66% of Bahrain’s Muslims. Census data in Bahrain does not provide for the population of individual religions except for Islam. Nonetheless, the Christian population in the kingdom is estimated to be 1,000 while the Jewish population is believed to be 40. Hinduism is practiced by a section of foreigners in Bahrain, with the kingdom having a few Hindu temples. Music is another aspect of Bahrain’s culture and exists in different types of genres. The most popular style of traditional music in the country is known as “Khaleeji,” which is composed and performed in the Arab world. Traditional musical instruments such as the Rebaba and the Oud feature prominently in Bahraini folk music. Sawt music and the zaffan dance were famous in the early 20th century but still have a significant following in the country. Modernity can be seen in Bahrain’s music, with western genres such as heavy metal and progressive rock being popular among the young generation. Some of the renowned local bands that perform from these genres include Death Box Audio, The Relocators, Hot Laser, and Bloodshed. The Osiris, a Bahraini band, gained global prominence in the 1980s for incorporating traditional Bahraini music with progressive rock. Football is the most popular sport in the kingdom, with the Bahrain Premier League being the top-tier domestic league for the sport in the kingdom. 1952 marked the first season of the Bahrain Premier League. Teams placed at the bottom at the end of a football season are relegated to the second tier professional league known as the Bahraini Classification League. Many of the local football matches are held at the Bahrain National Stadium. Another favorite sport in Bahrain is cricket, with the kingdom being represented in international competitions by the Bahraini national cricket team. The national cricket team has featured in the ACC Trophy on numerous editions after marking its debut in the 2004 edition. The Bahrain Cricket Association governs the sport in Bahrain. The kingdom has its domestic cricket league known as the Bahrain Cricket League which was founded in 1981. A total of 48 professional cricket teams participate in the Bahrain Cricket League. Mixed martial arts is another famous sport in Bahrain. The Bahraini government has invested heavily in developing the sport to positive results as the kingdom hosted the 2017 edition of the Amateur World Championships. Motorsport is quickly becoming among Bahrain’s top sports, with the kingdom having a Formula-One track. Motorsport competitions held in Bahrain attract professional racers from all over the world. The Gulf Air Grand Prix of 2004, which was held in the kingdom, was the first of its kind to be held in an Arab country. Arabic art has been made in the kingdom for centuries in the form of paintings, embroideries, crafts, and calligraphic texts. Bahrain is home to ancient pottery which has been dated back to the 3rd Millennium BC. Modern Bahrain art has its origins traced to the 1950s and coinciding with the formation of the Arts and Literature Club. Bahraini artists came together and formed the Bahrain Arts Society in 1983. The arts society has received assistance from the Bahraini government to enable the artists to receive training in Arabic art, as well as to host exhibitions in the country. A large collection of Bahrain art is domiciled at the Bahrain National Museum. Performance arts have a significant following in Bahrain, with a few theatres in the kingdom. Theatre enjoyed its golden age in the 1970s when famous local playwrights staged home-grown plays to great acclaim. The government is, however, investing in revitalizing the theatre industry in Bahrain and offers subsidies to the three non-profit theatres in the country. The government also oversaw the construction of the National Theatre of Bahrain, a 1,001-seater theatre in Manama that was opened in 2012. The film industry in the country is also growing, with Bahrain being home to about 45 cinemas. Film was introduced to the kingdom in the early 20th century with the opening of the first makeshift cinema in 1937. The country has since seen the establishment of modern cinemas including the kingdom’s first IMAX theatre in 2015. The total number of admissions in Bahrain’s cinemas was over 2.1 million in 2009. Due to its aridity and limited land resource, Bahrain produces a small percentage of its own food and relies on imports to meet domestic demand. Arabic, Indian, Persian, and even African influences can be seen in Bahraini cuisine. Rice, dates, and wheat are some of the staple food in the kingdom. Meat and fish also feature prominently in Bahraini cuisine. Lamb and mutton are the common red meats in the kingdom while chicken and fish make up the white meats cooked in most Bahraini households and restaurants. The most common dish in Bahrain is Biryani which consists of seasoned rice prepared with either lamb or chicken. Biryani has Indian origins, as an example of foreign influence in Bahraini cuisine. Coffee is the most popular beverage in the kingdom, with a local coffee brew known as “Qahwah” being recognized as Bahrain’s national beverage. Tea is also popular among Bahrain citizens and is served in many households.